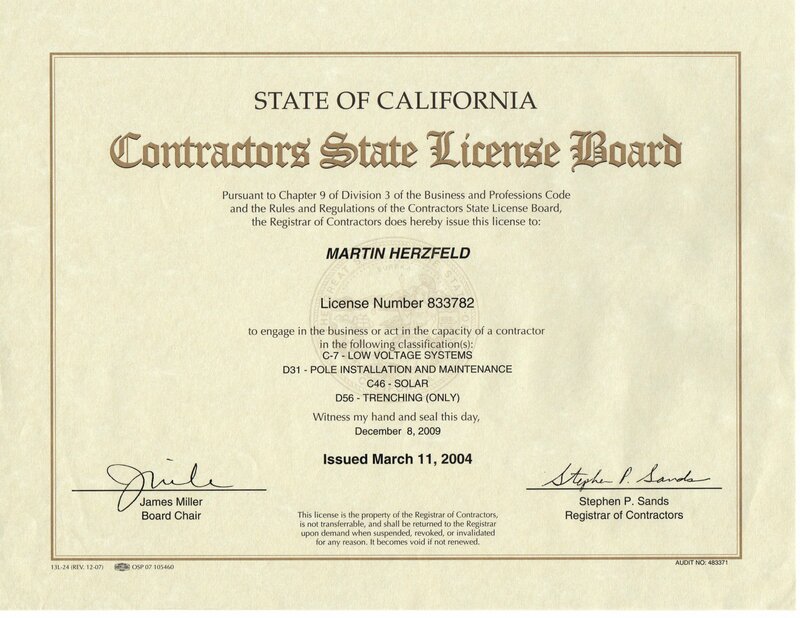 California Contractors License #833782: Solar Contractor, Trenching Contractor, Pole Installation and Maintenance, Low Voltage Systems - Instrumentation: "The qualifying individual is the person who meets the experience and examination requirements for the license and who is responsible for the employer’s or principal’s construction operations. 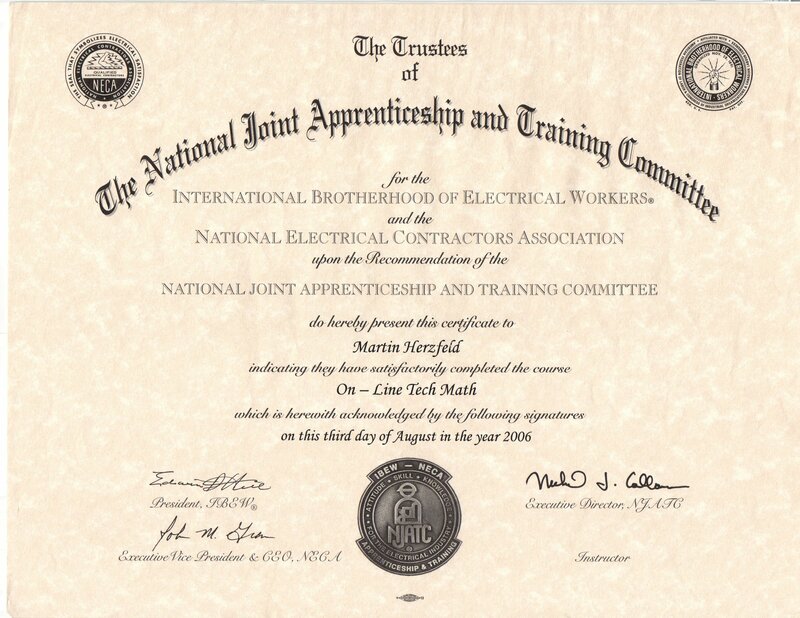 The qualifying individual must document at least four (4) full years of journeyman-level or higher experience in the classification." 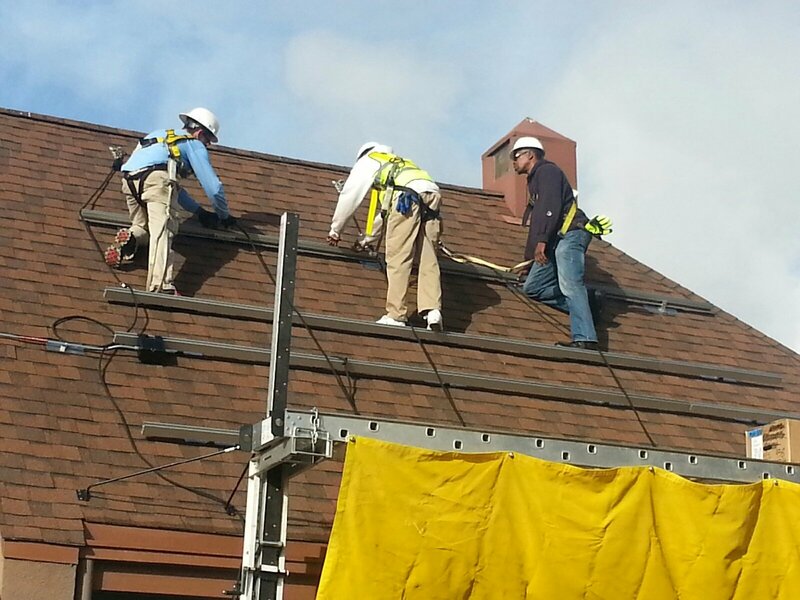 Underwriters Laboratories (UL) Certified PV System Installer #17: "Several years of hands-on experience in the field. 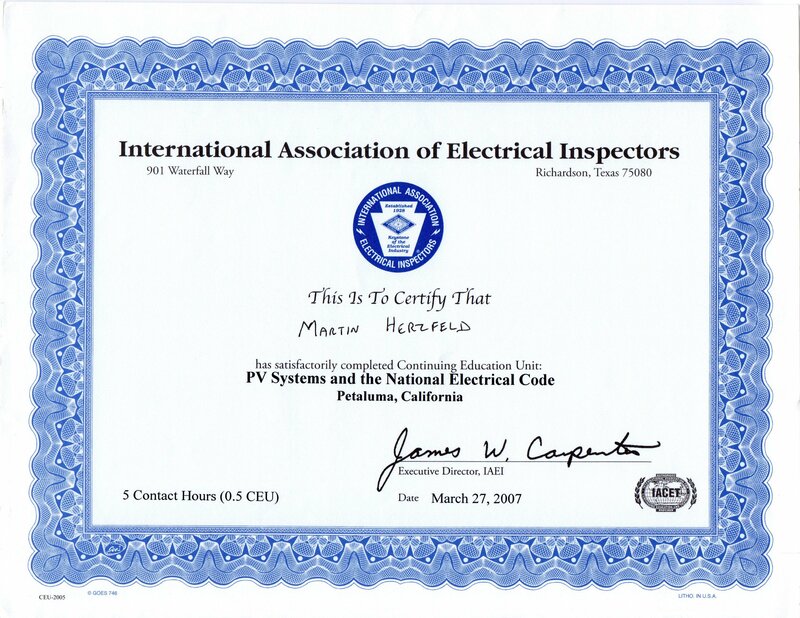 Hands-on experience or equivalent knowledge including installing, building, repairing, troubleshooting, diagnosing, verifying and performing tasks involved in electrical work either residential or commercial." 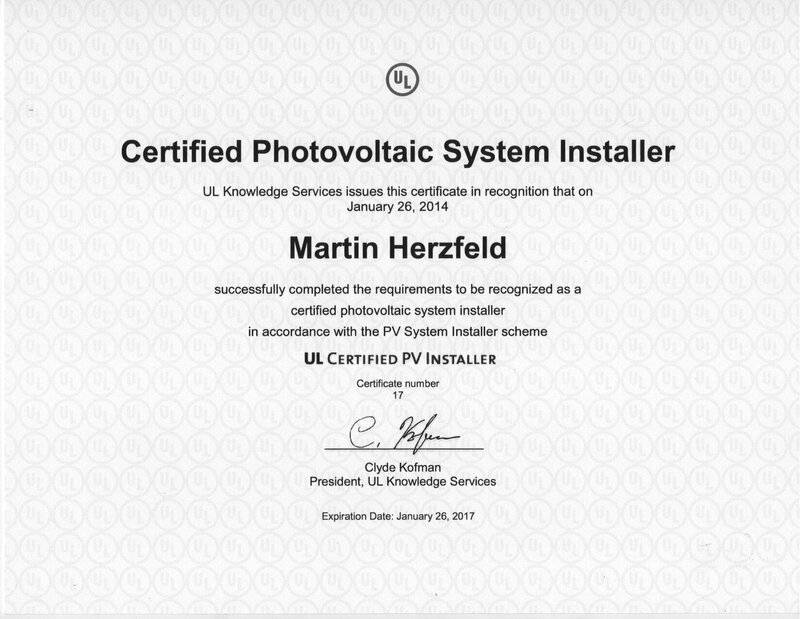 The highest PV installer certification requirements in the solar industry for safety - OSHA 30, a passpoint of 75%, a 3 hour examination with the greatest number of questions. 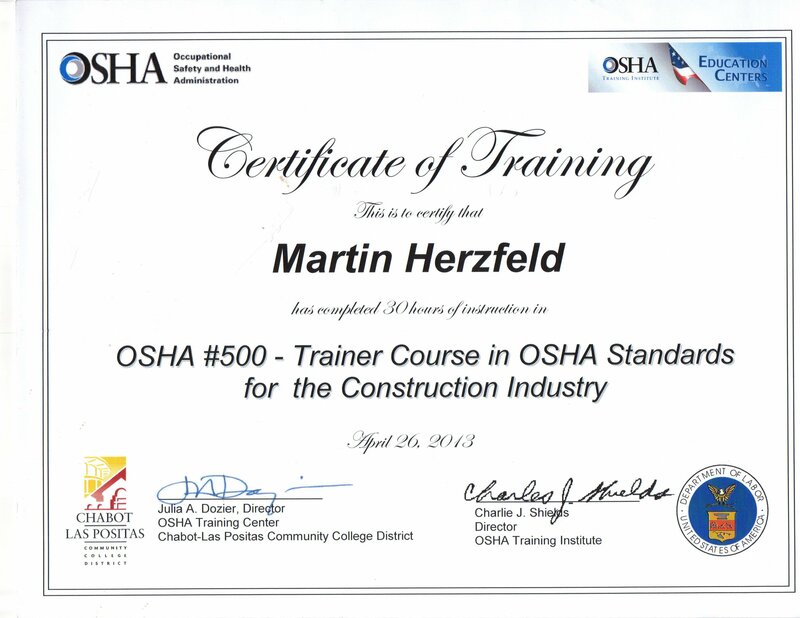 Achieved both OSHA 30 and the OSHA-Authorized Construction Trainer designation to issue both OSHA 10 and 30 cards: "Through this program, workers can attend 10-hour or 30-hour classes delivered by OSHA-authorized trainers. 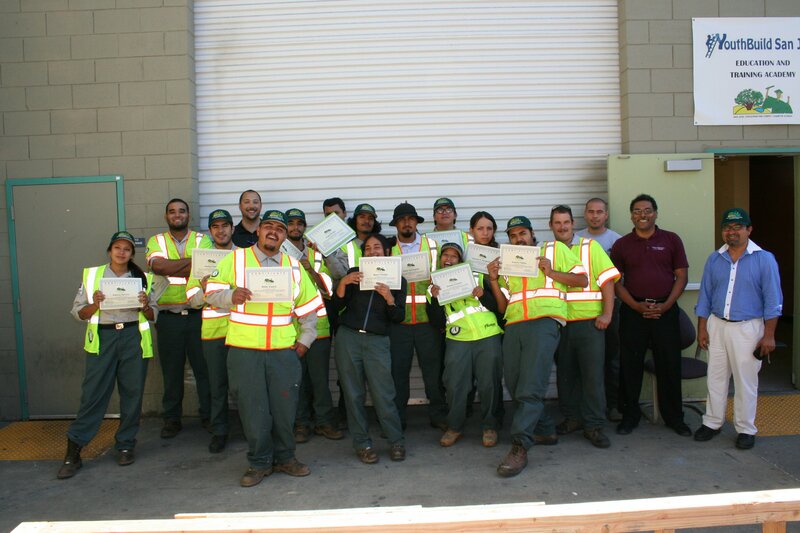 The 10-hour class is intended for entry level workers, while the 30-hour class is more appropriate for supervisors or workers with some safety responsibility." "Where there is no guidance, a people falls, but in an abundance of counselors there is safety" - A proverb. 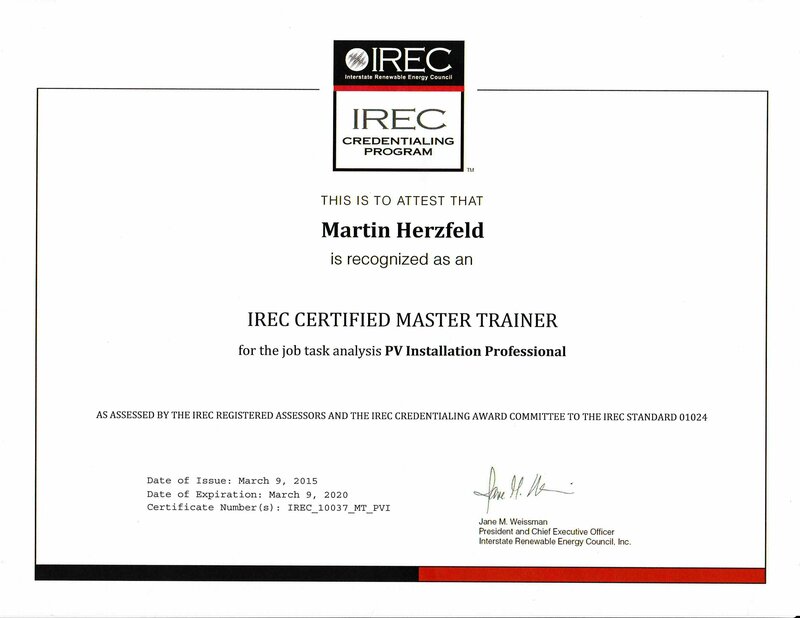 "IREC Master Trainer Certification — A credential awarded to professionals who have specific instructional as well as practical, in-field experience in the application of the knowledge and skills for which they deliver training and meet the requirements of IREC Standard 01024. 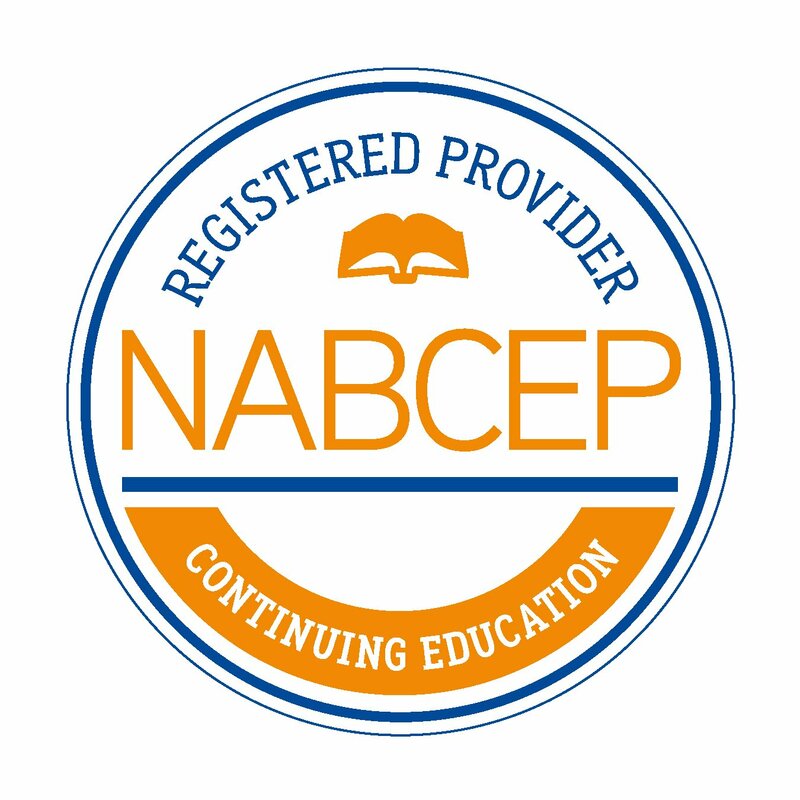 Certified master trainers are recognized within their industries as subject-matter experts and are deemed qualified to deliver high-quality training based on their ability to meet the requirements of this standard. In addition, master trainers train other instructors, have demonstrated instructional design experience, have formal education in teaching skills or pedagogy and hold a current professional industry-recognized credential or license." 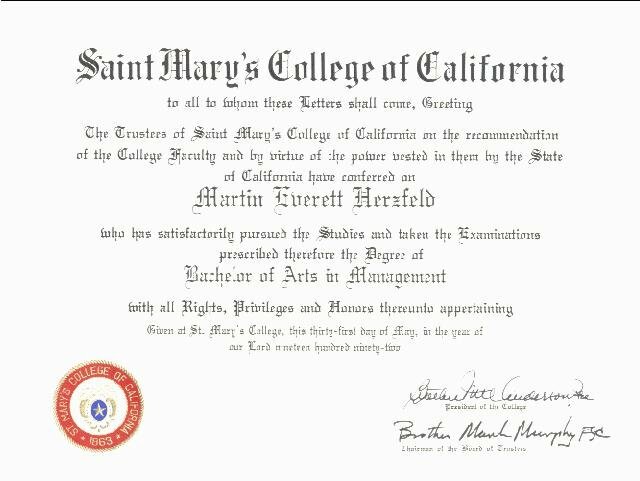 Degree Bachelor of Arts (B.A) in Management; Saint Mary's College of California: Planning and Development, Decision Making Techniques, Management Theory, The Practice of Management, Accounting and Financial Mangement, Project Management, Critical Perspectives, Personal and Professional Assessment in Management, Leadership and Ethic, The Management Profession, Problems and Prospects, Organizational Theory, The Economic Environment of Management, and Marketing. 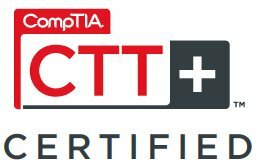 CompTIA Certified Technical Classroom Trainer (CTT+) #T3NSZCNBBKB4QTQG "Certification identifies excellent and dedicated industry instructors ... an international, vendor-neutral certification that covers core instructor skills, including preparation, presentation, communication, facilitation and evaluation ..."
Martin Herzfeld is an Advanced Continuing Education (CE) Training Provider for Certification and Re-Certification Classes for Solar (PV) Technology. 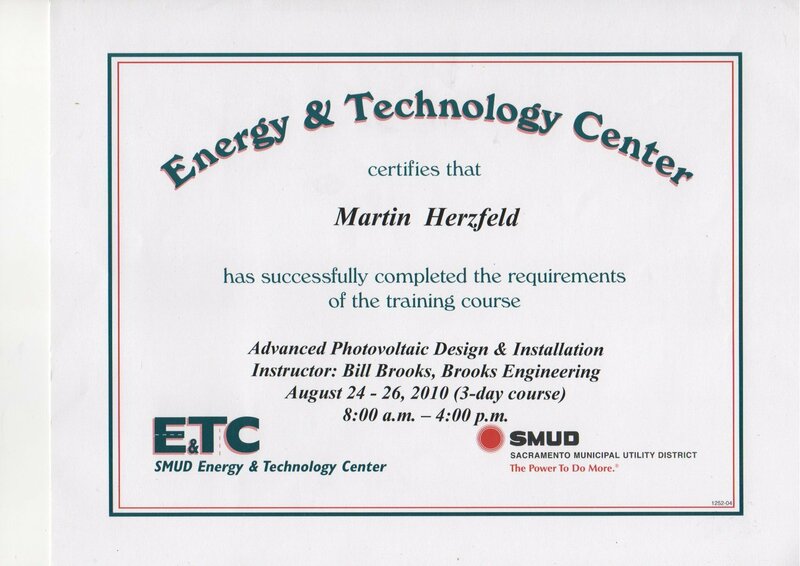 Moreover, completed more than (250+ hours) continuing education in various applicable electrical, building and international codes specific, and courses in advanced photovoltaics. 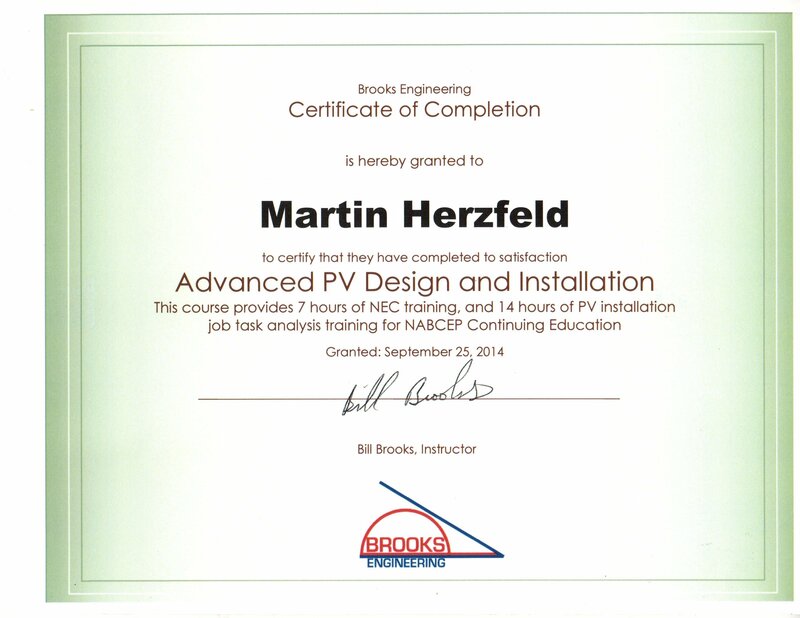 Continuing Education in Advanced Photovoltaic Design & Installation for the Solar Professional. 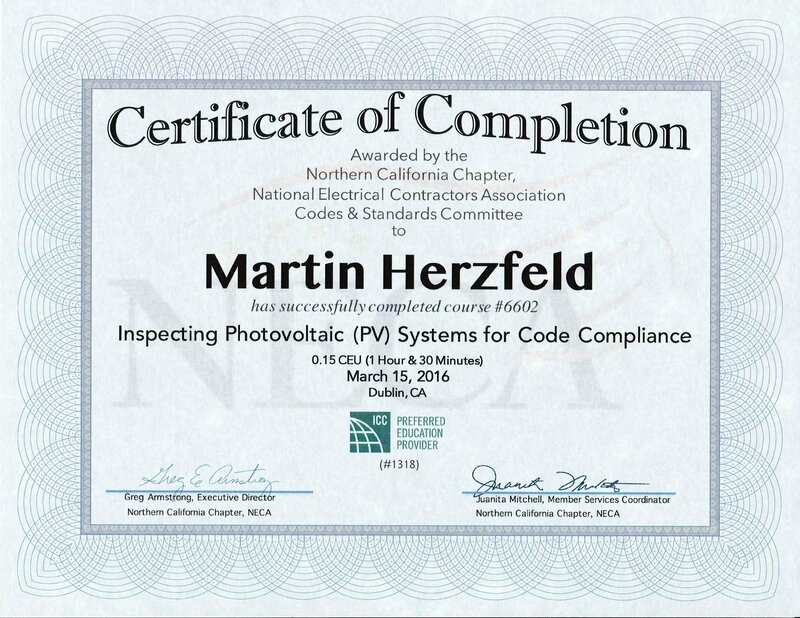 Keeping Up-to-Date on Advanced PV Design and Installation topics. 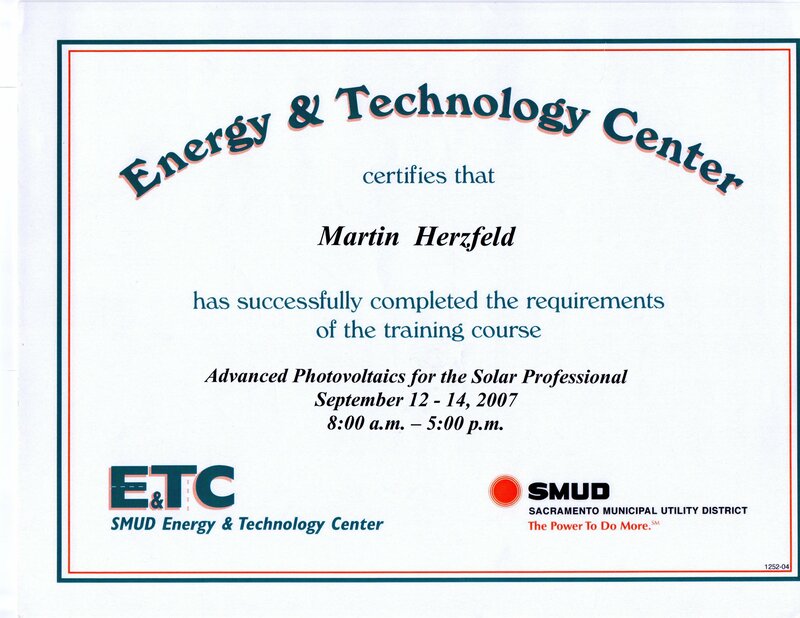 SWTDI Photovoltaic (PV) Power Systems Course. 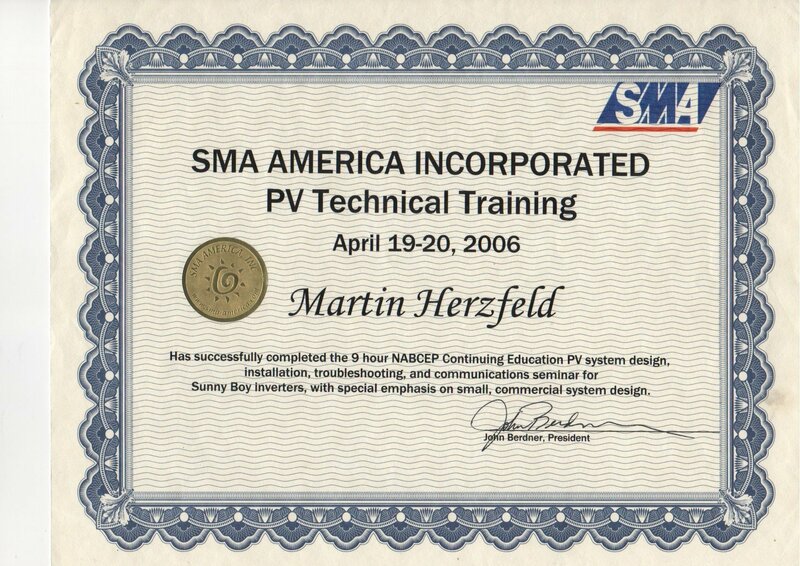 In addition to large commerical systems, completed PV technical continuing education training in PV System design, installation, troubleshooting an communications with emphasis on small commerical system design. 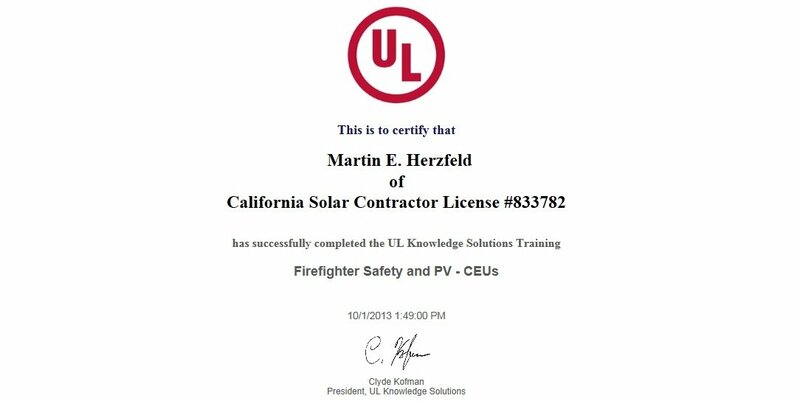 Up-to-date and completed CEU's on Firefighter Safety and Photovoltaics (PV). 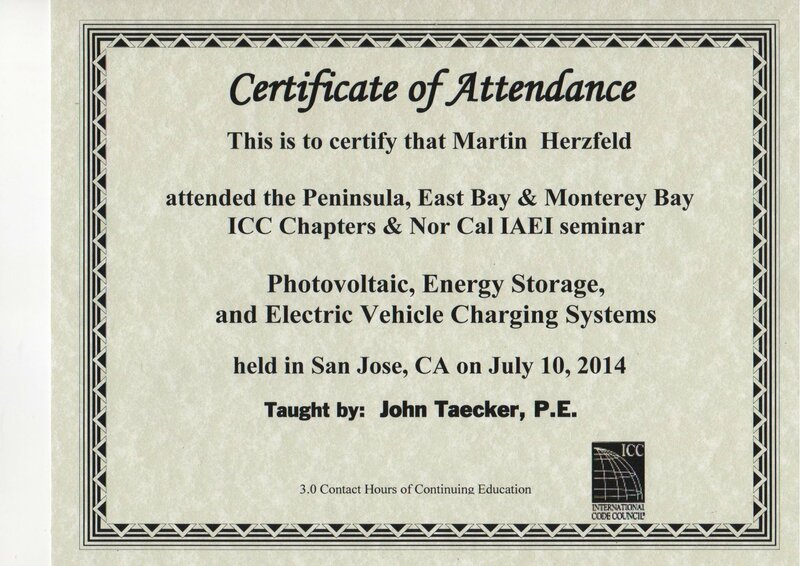 Up-to-date on code and standards for PV, EV and Charging Systems from the ICC Chapters and the Northern California IAEI continuing education. 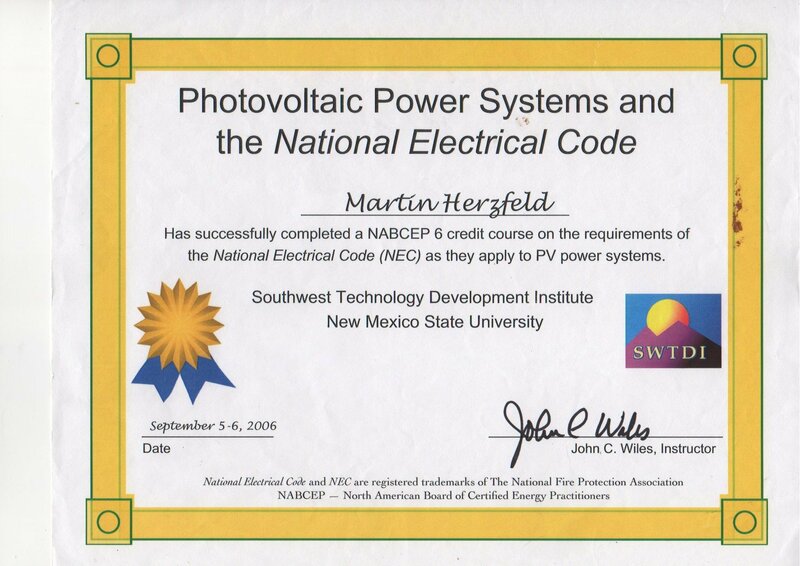 In addition, Martin Herzfeld has trained some of the very best students in more than a few hundred (500+ students) taught in solar technology for more than 5 years. 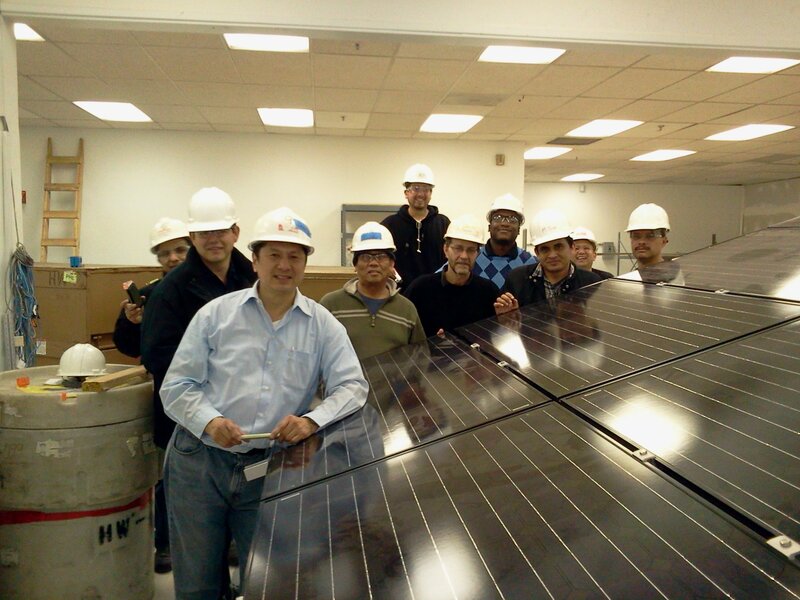 Photo: A few of my best students from a hands-on photovoltaics training course. 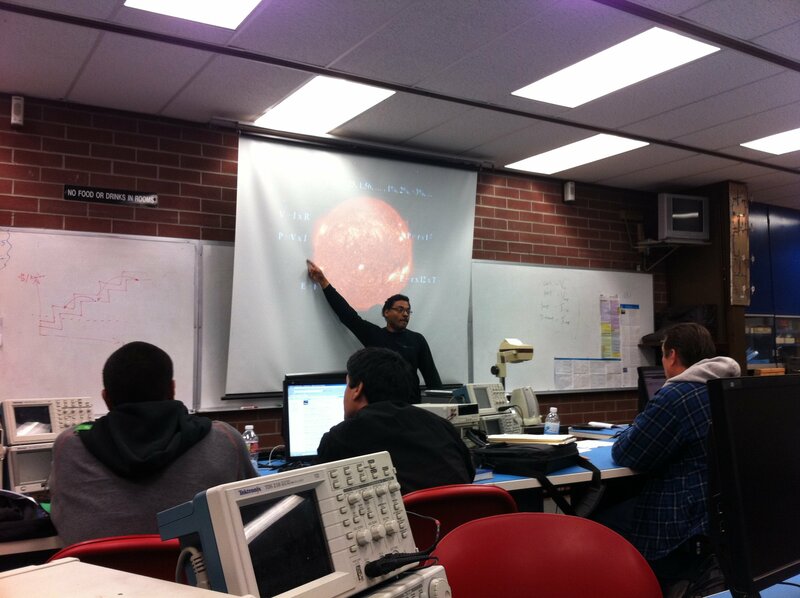 Photo: A guest speak at DVC, Pleasant Hill, CA. 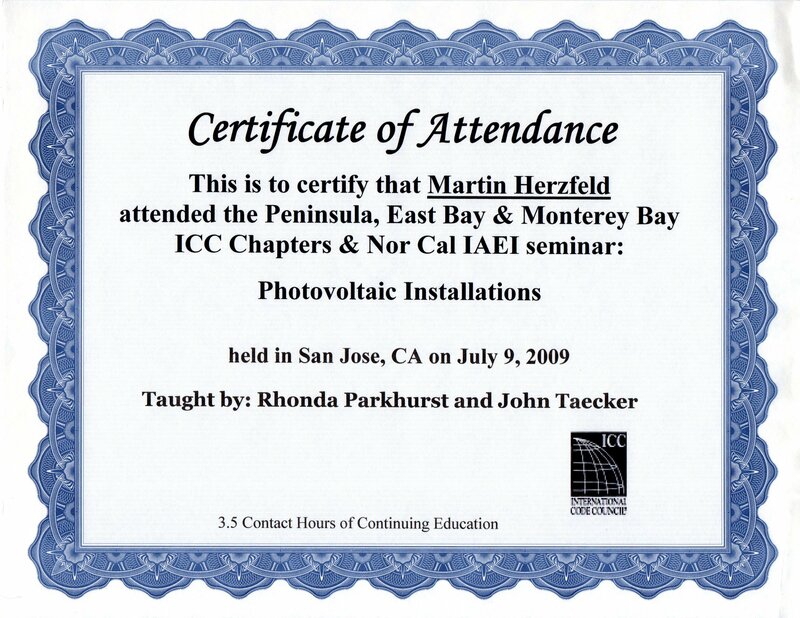 Martin Herzfeld is an Adjunct Professor at a California college near Sacramento, CA for both beginning and advanced PV systems and guest speaks and teaches class at other locations. Photo: Students learning use of multimeters - clamp-on, irradiance meters and other tools of the trade. 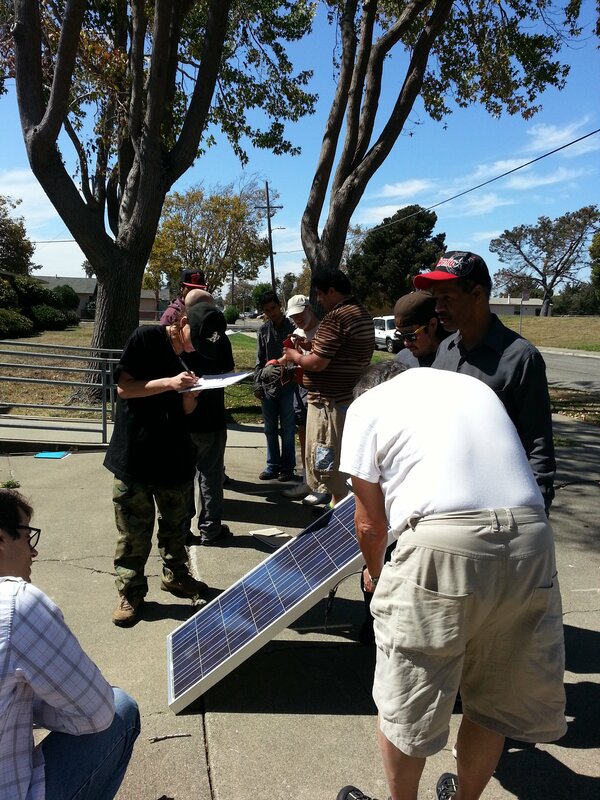 Photo: Previous Hands-On Classes also Specializing in Ground-Mounted Solar PV Systems. 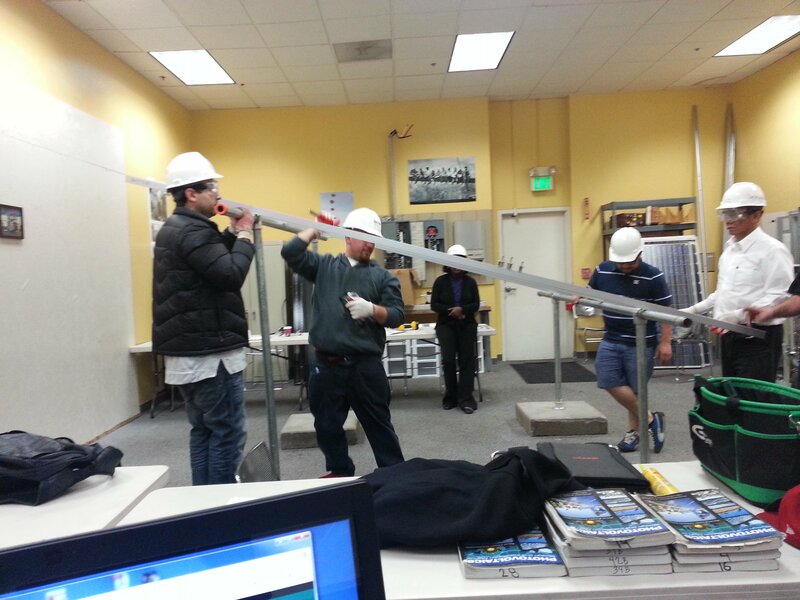 Photo: Students completing a five day class in Solar PV Systems Technology.